A good domain name is a critical business asset. Like the keys to your office door or access to your bank account, you need to keep your domain name under your company’s control. 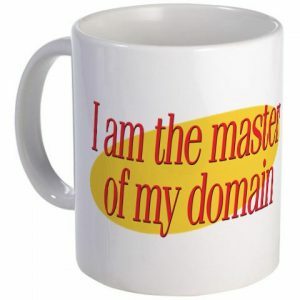 Unfortunately, I’ve found that many business owners (and by many I mean most) do not have control of their domain name. Many of them had their marketing company purchase the name originally. Some had the domain purchased by a younger, more tech-savvy employee who is no longer with them. In particularly bad situations, business owners may find their domain name held hostage by their former host or marketing company. Even worse, their domain name might have expired and been purchased by another company, resulting in downtime and sometimes litigation to regain control of the business brand. Part of the way you keep control of your brand is by keeping control of your domain name. Buy your domain name yourself, keep the login in a safe place, and keep it under your control. What I typically recommend to clients is that they keep their domain name separate from whatever companies they may be working with. This doesn’t mean that you can’t grant access to your SEO or marketing or IT company to make changes, but it does mean that you don’t allow them to transfer the domain out of your account. You should also not let your SEO, marketing, or IT company take over what are called the “nameservers” for your domain. Without getting too technical, nameservers are something like the post office for your domain. They store records about where email, website hosting, and other services for your domain name are located. You may hear language like “pointing the nameservers.” This is something that, in my experience, you do not need to do. If you purchased your domain name with GoDaddy or Network Solutions or any other registrar, your domain name and nameservers should stay at GoDaddy or Network Solutions. Unless you have very detailed and complicated requirements for your domain name servers (in which case you probably don’t need to be reading this post), there really isn’t much incentive to allow another company to take over your nameservers elsewhere. Keeping control of the domain name and its nameservers will give you the power and flexibility to do what you want to do with your domain name when you want to do it. Buy your domain name yourself, keep the login in a safe place, and keep it under your control. Your presence online will be the safer for it.